Last time, I looked at using a particular Google product (GMail) in a business environment. This week I'm looking to achieve a particular business function using a bunch of Google tools together. Used together they're going to be the foundation for a customer support site for people interested in industry information (Oil & Gas Technology) as well as my company's PR line. And the best thing? Once set up it's going to update itself regularly with minimal maintenance required from me. Sweet. This, is what we're heading towards. The idea is to create an Intervention Engineering branded website with useful dynamic content that also serves as a central support site for clients; one that requires minimal upkeep but stays fresh. Then if there's something I want to advertise announce I've got an interested forum with a ready made audience. I'm using these Google services because they let me setup and maintain this support and news site without my having to dedicate a lot of time to it. As you'll see below, I'm going to use these tools to leverage my existing activities to provide content for the site. Why not make this the main site? If you're online (Amazon, Google, etc.) your main site is you. It should be functional and intuitive. If you're offline (like me) your site is where people go to find out who you are -- because they've just heard of us or gotten our business card and want to know WTF we are. So it's formal, professional, and carefully crafted to deliver a strong message of who we are. The blog is conversational, less formal and more generally informative. Can You Blog a Business with Blogger? Indeed you can. A nice feature of Blogger is that it allows you to host your own blog while still using their platform. While I'm developing the blog I'll sandbox it at Blogspot, but when it's ready for release I'll host it on a subdomain like blog.intervention.com.au. Customize your template. Branding is key, make sure your colours and logos are consistent with your existing website(s). It's a blog so it can (and should) be less formal, but maintain a consistent look and feel. Blog Widely, Blog Often. This may be a bit controversial, but I'm going to make this site more about the industry than my company. I think this is vital to keep the blog ticking over regularly and a small company will struggle to come up with material. Mind you, I'll blog the s**t out of anything noteworthy that our company does, but I'll also have regular industry posts. My hope is that local industry will start visiting regularly, and the blog will become a part of their browsing routine. Be fair and objective. This follows on from the last point. The blog is less formal than our main page, so we don't have to stick as closely to the script. If there's a problem with a product or project, here's the place to admit it and discuss it with users. If a partner company has a cool new toy, talk about it. Big new project coming up in the region? Talk about it. You get the idea, yes? Encourage interaction. Respond to queries and try and generate discussion and conversation in the comments. Ask questions of your readers to initiate conversations. Trying to decide on which feature to implement? Ask people! Make people know you're there and listening, and give credit where it's due. Why should you bother? It'll make you site dynamic, with useful commentary for zero effort. An active community of readers and regular commentators is the life blood of a popular site, it's difficult to achieve but worth the effort. This stuff is cool because it adds content without having to put in any effort. Google's related content links lets you add dynamic content in the form of news, web links, videos, and searches based entirely on the content of your page. I've added this related link applet to the bottom of each post to provide readers with additional information on the topic of the article. It's an excellent way of adding depth -- without having to do the hard work yourself. Use Google Reader to leverage your browsing habits to provide content for your support site. Each morning I trawl through a couple dozen RSS feeds to get my news fix. That includes a half dozen oil & gas industry and tech feeds. If there's something of particular note, I'll write it up as a post on the blog -- but there's always at least 2 or 3 items that are noteworthy but not worth writing up on my own site. Google Maps on websites are cool. They're an excellent way to share information, and they're interactive to boot. The Google maps API makes it easy to add a map to your site, for an excellent tutorial on putting a map on your blog check out the aptly titled 'How to Insert a Map Into Your Blog'. What you put on your map depends on your business. 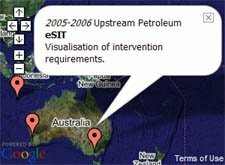 IE's projects are based in remote location all over the world, so I'm going to mark the locations of our projects and provide a little information about each of them. It's an effective way to provide a list of our successful projects and our global coverage. For real-estate or travel sites the use here is obvious, if your business is entirely local, you could put up a map of your exact location. I've put my map on my support site, but it could just as happily live on the main site, YMMV. GoogleTalk is a great tool for interacting with your clients. The ability to support your customers using IM or voice is the way of the future. Maximise the potention by using Google Apps for Your Domain, create a new alias specifically for client support enquiries. I'm setting up Support@Intervention.com.au. Because we're using GMail, we can use GoogleTalk for IM, VOIP, and Voicemail -- as well as a centralised support email address. Using hosted GMail nicknames you can shift the responsibility for online support to suit you, without needing to log on to different accounts or change contact details. Your clients email / IM / talk to support@intervention.com.au -- but support is a nickname for me or Stuart depending on who's rostered. I' ve already written an article on Gaining Trust with Google Coop, it gives a decent idea on how I think Coop should be used. I won't go on for long now, but essentially, you can leverage your existing knowledge by making it available to subscribers to your Coop profile. Once people are subscribed, your rankings and subscribed links will affect their search results. If done well Coop can form an excellent part of your communications strategy. I'll talk more about coop in a later week when I discuss how to increasing your public profile and becoming an influencial voice in the online community. This one is going to take a bit of effort on my part, I'm going to use Google Apps for Your Domain, Spreadsheets, Writely, Blogger, Calendar, Google Desktop Search, and the Calendar API to manage a project. It's going to include timesheeting, invoicing, scheduling, and internal discussion tracking. 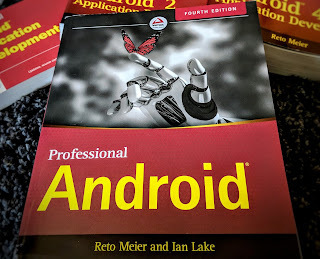 I'm going to need to write a couple of applications that make use of Google's APIs to help smooth this process along, so I'm going to be busy, but I should have a couple of cool tools to share when I'm done, so keep tuned! Wandered in here via the Blogger homepage when your irresistibly-titled blog appeared on the recently-updated list. I'm in proj mgmt myself and am very much interested in your Google API ideas ... keep me posted!